I didn't buy the full size for this line, I only tried the sample set which lasted ~1 week. 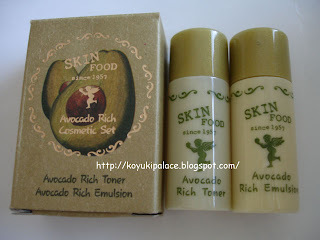 It has anti-oxidants and supplies nutrients to your skin. 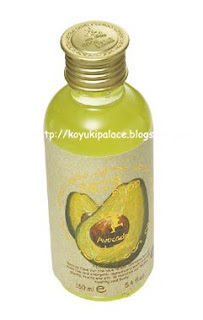 Suitable for dry skin, helps balance oil secretion and smooths fine lines. It smells like berry and nothing like avocado.... the texture is the same as some of the Skinfood toners, thick (more like a light gel), easy to spread, fast absorbing and very hydrating. It does an excellent job with oil control, after using it for ~1 week, the size of my pores reduced and my skin became softer.